On 2 March 1244 the population of the fortified hilltop village of Montségur in the Languedoc region of south-west France surrendered to the forces of the French king, Louis IX. They had survived a siege of around ten months, but in a daringly clever act their attackers had broken through their defences and two months later the siege was over. The king was acting in the name of the Catholic Church in pursuit of heretics that the Church called 'Cathars'. On Wednesday 16 March – which happens also to be a Wednesday in 2016 – the 224 Cathars who were among the 361 inhabitants of Montségur were taken down to the base of the mountain and thrown onto a bonfire. We know little about the Cathars: the enemies who finally obliterated them had no interest in preserving any aspect of their culture, on the contrary, they did their best to demonise them and destroy all trace of them. Eight centuries of historical turmoil have ensured that what little the Cathars left behind has now become almost nothing. Both Nature and History abhor a vacuum. From the end of the nineteenth century this space of unknowing has been filled up with whatever mad theories came into people's heads. The fortress on the hilltop of Montségur has been identified as a solar temple aligned with the summer solstice and its occupants the Cathars as followers of Mithras, part of a dualistic cult of light. The Holy Grail (of course) is or was in there somewhere. After the capitulation some mysterious treasure was smuggled out of the fortress and hidden somewhere. All of these theories are complete nonsense. 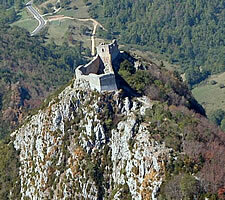 The fortress that we now see has nothing to do with the Cathars. 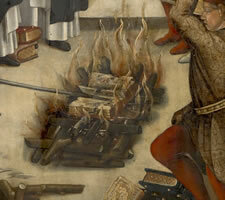 Their fortress and houses were razed to the ground in accordance with Canon Law governing the treatment of heretics. 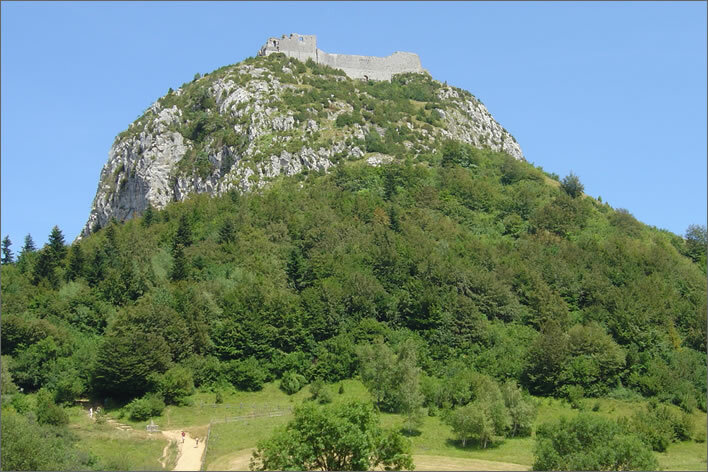 The ruins which we see today are of a castle that was erected by the son or nephew of Guy de Levis, who had acquired Montségur by right of conquest when the siege was broken. This final fortress was not aligned in some special way with the sun: it is aligned with the top of the hill and for its size it could not have been aligned in any other way. The theological heresy of the Cathars is not easy to reconstruct but it was certainly nothing to do with strange eastern cults. There are two reasons for the continued existence of this nonsense, which sane people should have abandoned a long time ago. The first reason is that the New Age hippies, the treasure seekers, the conspiracy theorists and Grail hunters bring a substantial tourist revenue to the region. The local and regional governments and publishers of books and magazines have every incentive not to dampen the delusions of those who visit Montségur. Any publication that does not immediately distance itself from the lunatic ideas is not worth reading. 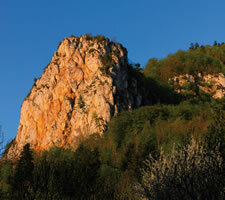 The second reason is that the calm scientific studies of Montségur have been almost exclusively published in French. 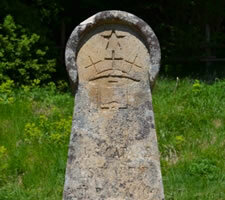 The archaeological work particularly is buried in many regional archaeological publications. Government money for the mythbusting of popular tourist fantasies has been difficult to come by over the years. Over the last few decades some good and judicious summaries of the events and interpretations of the history of Montségur and the Cathars have appeared, but mostly in French. The New Age anglosphere has been largely insulated from such empirical rationalities. 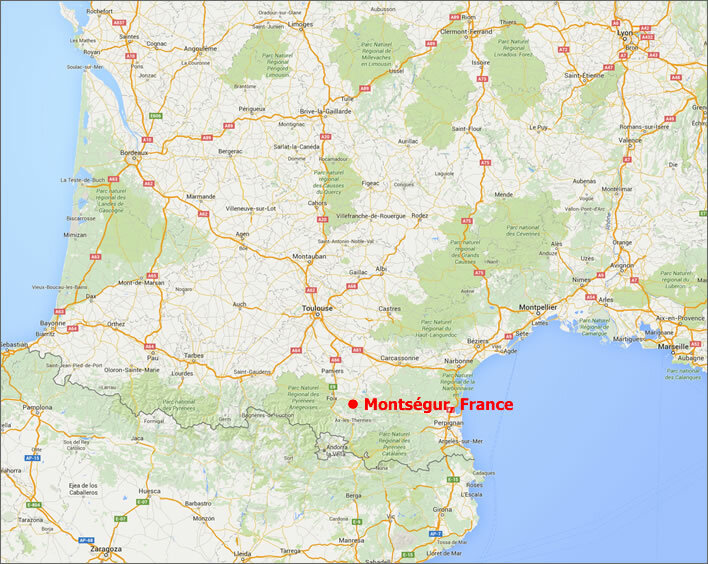 The following account is just a summary of the fall of Montségur and the events around it. I have passed over many details and have helped myself shamelessly to the wisdom of the main publications in the field. If you want more detail you have to go to them. The final page, Montségur: video material, contains some embedded videos from YouTube on the theme of Montségur. They are all in French but they all contain excellent visual material which you can enjoy even if you don't speak French. Roquebert, Michel. Histoire des Cathares: hérésie, croisade, Inquisition du XIe au XIVe siècle. Nouv. éd. Paris: Perrin, 2002. Collection Tempus 17. Roquebert, Michel. Montségur: les cendres de la liberté. Toulouse: Privat, 1998. Ivan, Colin. Jacques Berlioz et Jean-Claude Hélas, dir. 'Catharisme : l’édifice imaginaire. Actes du 7e colloque du Centre d’Études Cathares (29 août-2 septembre 1994)'. Carcassonne, Centre d’études Cathares, 1998 (Heresis, 7). Cahiers de civilisation médiévale 42.167 (1999): 277–282. Sarret, Jean-Pierre. 'La communauté villageoise de Montségur au XIII e siècle (Ariège)'. Archéologie du Midi médiéval 2.1 (1984): 111–122. Online. Charles, Higounet. 'Démythifier Montségur : 'Montségur. 13 ans de recherche archéologique, 1964-1976', Bulletin du groupe de recherches archéologiques de Montségur et environs, n° spécial 1980 [Carcassonne, 1981]. Annales du Midi : revue archéologique, historique et philologique de la France méridionale 94.158 (1982): 322–323.